Over the last few years, I’ve noticed a new practice rearing its ugly head at gift-giving events. As guests arrive and deposit their gifts, they are asked to address an envelope to themselves. The guest of honor takes these envelopes home and eventually deposits thank-you notes into them, needing only to slap a stamp in the upper right corner to make them mailable. This offends me. 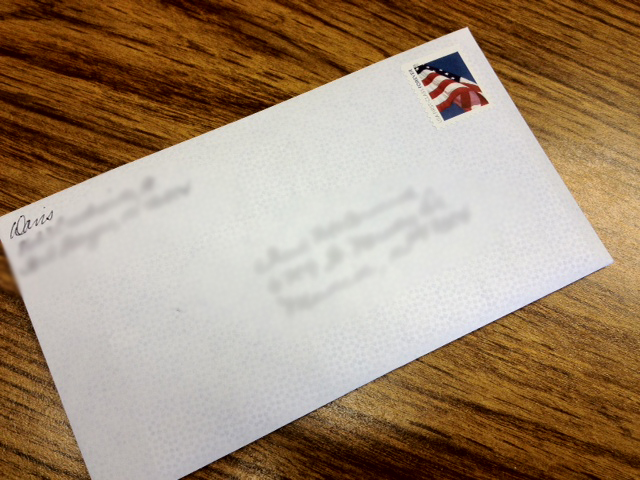 Call me old-fashioned, but addressing my own thank-you note just seems crass and, well, lazy. I’ve bought a gift, added a card and pretty packaging, and happily delivered it to whichever event I was summoned. I don’t think it’s wrong to expect the recipient go to the “trouble” of writing my address. Don’t get me wrong; I’m generally glad to share in the celebration. I don’t begrudge the gift, and I appreciate the acknowledgment. I guess what gets my goat is that this practice transactionalizes the whole affair–as if the gift and the thank-you fill a square instead of carrying specific meaning. Maybe self-addressing makes the acknowledgment process more efficient, but it certainly feels less sincere. The next time I attend one of these events, I intend to skip the self-addressed silliness. If I receive a thank-you note, I’ll know it’s because the person cared enough to send it–not because I made it easy.